Richard Fahey's Queen Kindly took the step up to Group Two level with victory in the Sky Bet Lowther Stakes as hot favourite Fair Eva could manage only third. The two Frankel fillies dominated all the pre-race hype and it was Roger Charlton's Fair Eva who was sent off the red-hot 4/11 market leader in the colours of her great sire, with the Jaber Abdullah-owned winner 9/2 second-favourite in the hands of Jamie Spencer. Fair Eva loomed up dangerously on the wide outside as four of her rivals shared the lead a furlong and a half from the finish, but she just didn't go through with her effort and flattened out to finish third as Queen Kindly, out of 2009 Lowther-winning mare Lady Of The Desert, burst through a gap between Clem Fandango and Roly Poly to record a quarter-of-a-length victory over Aidan O'Brien's filly. Spencer said: "The odds never reflected her chances. She ran at Ascot and Seamie (Heffernan) rode a very clever race on the winner (Brave Anna). When I was coming with my run, I had to wait for him to go and she couldn't get to grips on the soft ground. "Every time you ride her she gets chunkier and more powerful and she never missed a beat today. "She was running away in behind. I was worried what I was going to say to Jaber (Abdullah, owner) two furlongs out when I couldn't get a run, because he told me not to get boxed in. "Anyway, we got out and she was gutsy and tenacious. "She's very professional and at this stage of her career, she's probably ahead of the rest of them. "She's a gorgeous filly and Richard fancied her. 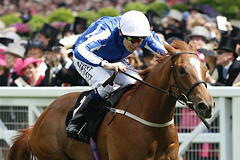 He said 'don't worry about the other Frankel (filly, Fair Eva), we know what we've got." A downbeat Smullen told Racing UK: "I was never really comfortable and she never felt at ease today. "We all know she's an exceptionally good filly but she hasn't shown that today. "She got warm beforehand and maybe something will come to light. She didn't run badly at all but she didn't quite perform as we expected." Lowther sponsors Sky Bet cut the winner to 10/1 from 20/1 for next year's 1000 Guineas and representative Michael Shinners said: "Richard Fahey is obviously a little wary about going up to a mile given his filly's pedigree but Queen Kindly is obviously improving swiftly and given the strength of Fair Eva in the Guineas market before today, we've halved the price of Queen Kindly for the Classic."